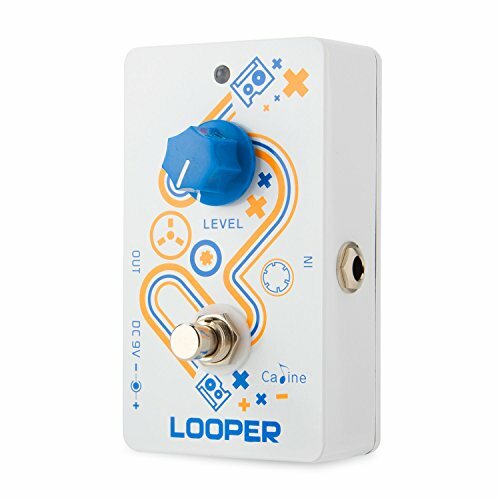 * The CP-33 looper pedal has a 10 minute loop time and an unlimited amount over overdubs. * Pressing the foots witch and the LED should go red --begins recording the loop. * Pressing again and LED tune blue-- replays the loop. * You can then press the foot switch again, onto red mode, to record another layer of the loop, and again into blue mode to mark the end of the loop. * Can do this as many times as you want adding layers to the track. * When there is no light visible the looper has no loop stored. * When the blue led is showing press the foot switch twice to pause the playback, and again to resume. Focus on the Single Loop Function -- 10 minutes of loop recording time and unlimited superimposed recording. Simple design that the foot switch controls the working status,and the LED light shows working status, easy to use. Fast Response & Clear Records -- Adopt high-speed memory card. Capture the recording beats accuratly and record a high-fidelity sound. Sensitive Recording Switch -- The foot recording switch is sensitive and quick response, so that the phrase is continuity and no blank, sounds smooth. High-quality Natural Sound -- True lossless bypass, analog signal dry sound through, create transparent tone, no tone loss or noise. Mini Size & Excellent Quality -- Portable mini size,easy to carry and space-saving. And with aluminum alloy shell,it's durable and stable.